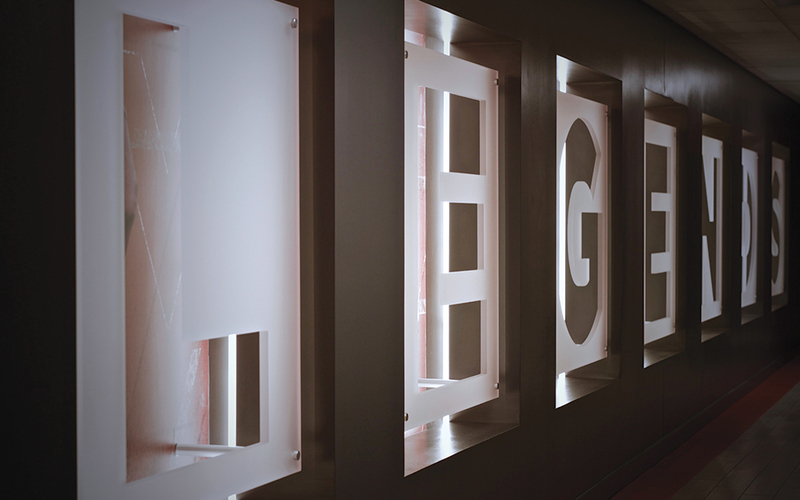 Joba CEO, Kevin Jones, was the creative design director for the Merryman Center renovation at Virginia Tech. It is a $10.6 million all-purpose building and is one of the finest facilities of its kind in college athletics. Challenged with maintaining facilities that attract world-class student-athletes, VT wanted to upgrade the Merryman Center. Our task was to reimagine and re-envision the Merryman Center. The Merryman Center at Virginia Tech (VT) is a 40,000 square foot facility that pays homage to VT athletes, past, present, and future. The facility features a “Hall of Legends,” position meeting rooms, training rooms, and coaches’ offices. The “Hall of Legends” showcases memorabilia from former Virginia Tech athletic standouts and numerous awards won over many seasons. As the number one recruit in the football program's history as well as a trained industrial designer, Virginia Tech Athletics asked Kevin Jones, CEO of Joba, to provide creative direction to the Merryman Center renovation project. Kevin and team worked closely with a large design-build construction firm to design, render, and oversee installation of all elements at the Merryman Center, in the hallways, main, and lower floors. A space dedicated to hokies of the past, present, and future. That is how Kevin Jones, a Hokie fan and an NFL veteran, employed user centered insights to envision an up-to-date Merryman center. Our process started with research. An athlete himself, Kevin was aware of the impact a facility of such proportions could have on recruits, players, coaches and fans. Kevin and team worked closely with the design-build firm to generate concepts for laying out spaces, walkways, installations, and other functional elements. Research about persona profiles, past, present, and future athletes, helped us outline, ideate, sketch out, and design a variety of installation elements. Some elements spoke to paths players take to the NFL. Other elements outlined major events that helped build VT Football to its current glory. Kevin used the space to honor bowl games, first round draft picks, famous coaches, hall of fame inductees. Some installations were internal wall graphics, while other elements involved physical installation, displays, including special collection memorabilia. 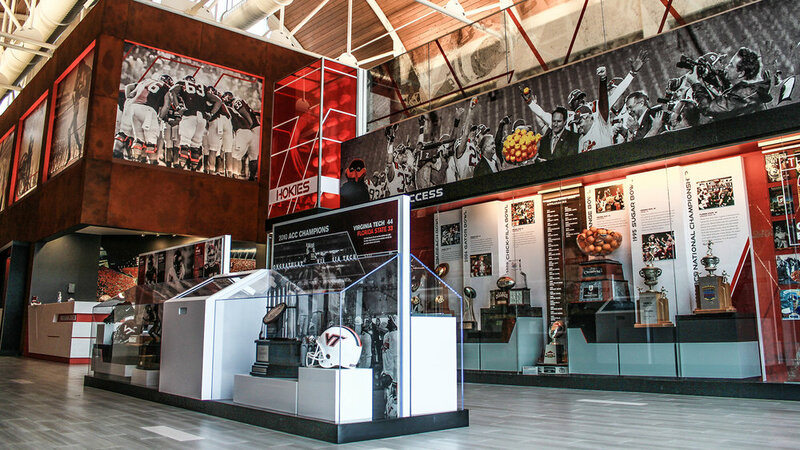 The redesigned Merryman Center is a shrine for VT Football and athletics fans, a space where fans, players, etc can come together to come face to face with the heritage of VT football and athletics, while players and recruits can dream about creating their own legacy.